This GPS passive patch antenna is a good fit for many requirements, particularly for mini-cards that don't have support for an active antenna. Its small size at 20 x 20mm and 4mm tall makes it very flexible in terms of fitting into an enclosure. 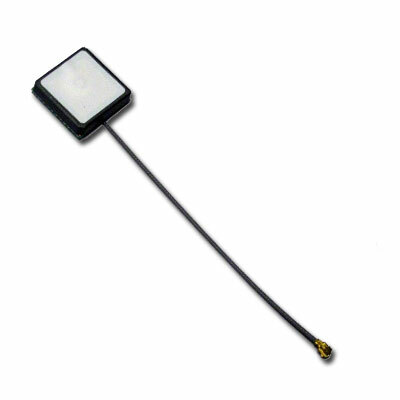 As with most passive antennas, it has very small gain so will rely on an LNA that is either integrated into the GPS module, or placed in-line with the antenna. The U.FL connector is used in most GPS applications for its compact size and good loss characteristics. the cable is 1.13mm coax and is 100mm long, but can be special-ordered at different lengths.